Have a JT65B QSO - I have completed quite a few contacts on 10W, mainly on 17m, it is amazing how far low power can reach as I have made contacts from Japan to South America. Run WSPR to test antenna configurations - I have used WSPR to check out antennas as I have made changes. Build a 70Mhz amplifier - I completed my 70Mhz transverter by adding a 10W amplifier made by an amateuamateur in Poland. It now drives a Philips A200 linear to 50W. Erect a 50/70Mhz beam - I built a 4m Moxon but still want to get something better up. Have a go at meteor scatter operation on 50/70Mhz - not achieved, the 4/6m beam is a prerequisite. Receive signals bounced off the moon. Not achieved, I'm going to take it off the list. Do some portable HF operating with my FT-817. Not really achieved, apart from one contact while on holiday. Get my CW speed back up to something usable - I think this is a long shot but it needs to be on the list! It's improving but still a little way to go. This year I decided to try some operating from our holiday location of Saas Fee in Switzerland (JN36xc, or so the app on my phone told me). 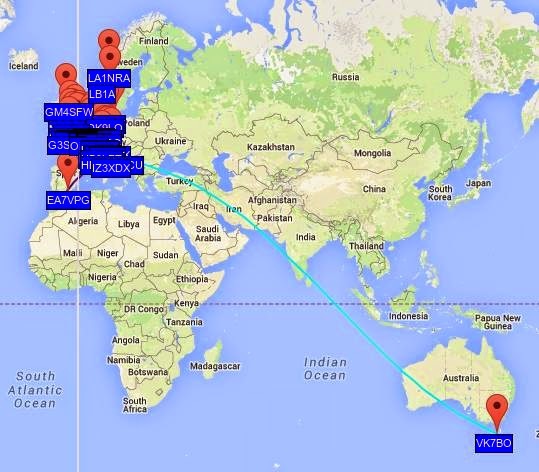 I decided to only use WSPR and JT65 on the 40/20/17m bands. These are the bands that I have made loading coils for use with my PAC-12 vertical antenna. Digital only because 5W from an FT817 doesn't go very far when surrounded by 4000m peaks on three sides as Saas Fee is. It took me a while to make my first JT65 contact (on 17m) because at times the QRM on 20m was very high, with some specific QRM on the 17m JT65 frequency. I didn't track down the cause of the interference but I assume it was something in the village. When it was not present I received signals from Japan to south America as you can see from the PSKreporter screen shot below. I was pleased to see that my JT9 signal was received in the US. 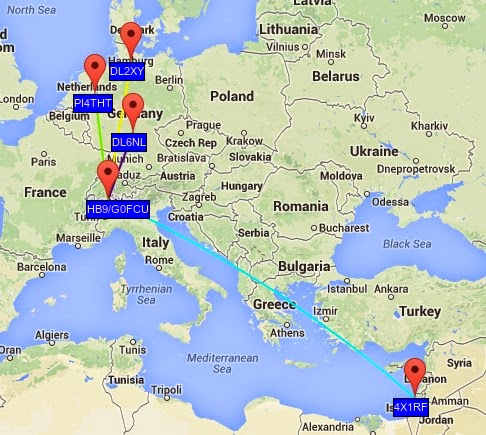 40m WSPR reception was good around Europe. 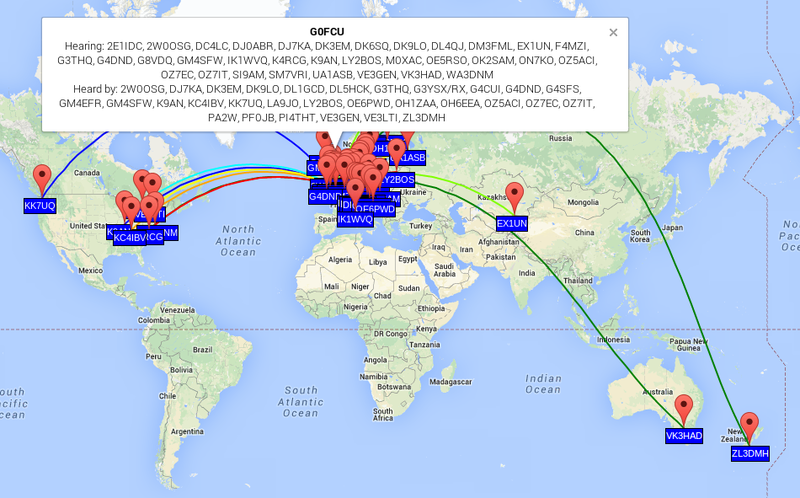 My 40m WSPR signal was received in VK. Despite calling CQ on JT65 and JT9 I only managed to make one JT65 contact, this seems odd to me given the fact that I could see that my signal was being logged on PSKReporter. 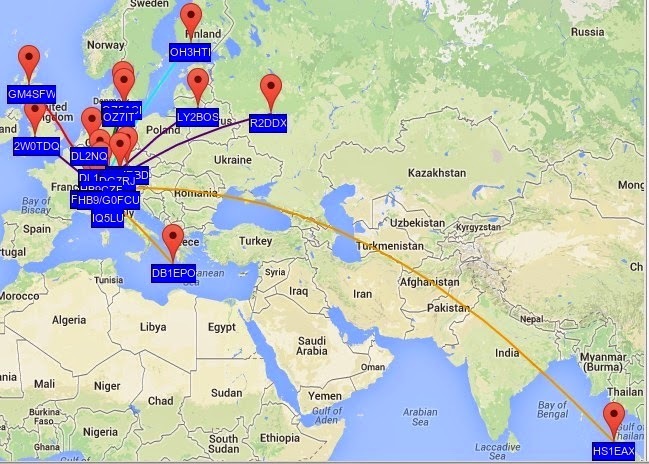 I am happy that my antenna was working well based on its performance with WSPR. Other stations got confused by the different message format that JT65 generates when using a callsign prefix. Given that the take off was shielded on three sides by 4000m mountains I am pleased with the receive performance of the PAC-12 antenna. On one day I took the 817 out of the apartment and tried for some SSB contacts on 40m. The beauty of the location I was at is that at 2397m it was about 600m higher than Saas Fee and with a clearer take-off to the north. The noise figures on 40m here was S0 and there were many special event stations loud and clear. Unfortunately, they were generating pile-ups that I was not going to break through with 5W. I did have one contact into north Wales but it was hard going for the other station. I would like to get my CW skills polished up so I can try some QRP CW for holiday operating, next year we are going on holiday to somewhere with a better take-off which might also help. The Meteor M-N2 weather satellite, previously described here, picture received on 20/09/2014 shows a large thunderstorm in the English Channel, completely filling the area of sea between Cherbourg and Le Harve. Just after I received the picture I grabbed a screen shot from www.lightningmaps.org of the real time lightning strikes from the storm, see below. 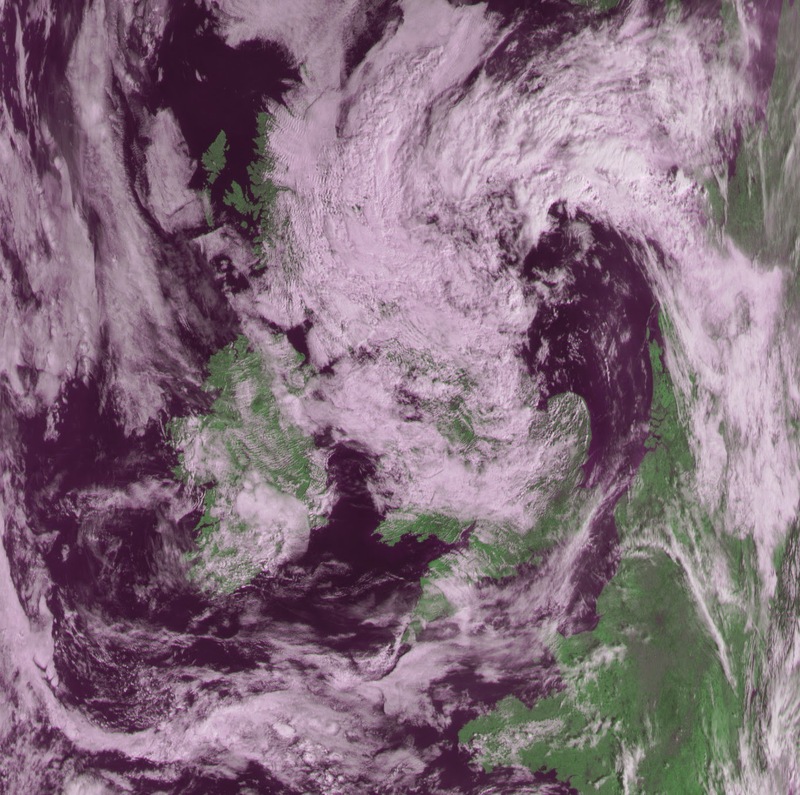 The full Meteor M-N2 image I received is below. The Russians recently (2014) launched the second in the line of Meteor M weather satellites. 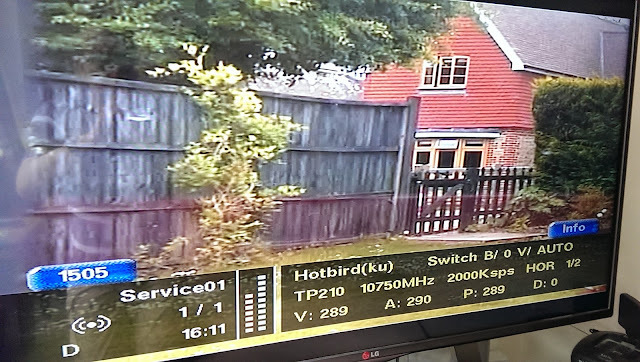 Meteor M-N2 transmits Low Rate Picture Transmission (LRPT) format pictures round the clock on 137.100Mhz. This format is of higher resolution that the older APT format. There have been two excellent people helping with software and advice on how to receive images from this satellite. These are Raydel Abreu Espinet, CM2ESP, and Oleg Bekrenev. Oleg has provided a program to process the captured signal and produce images like the one you see above. 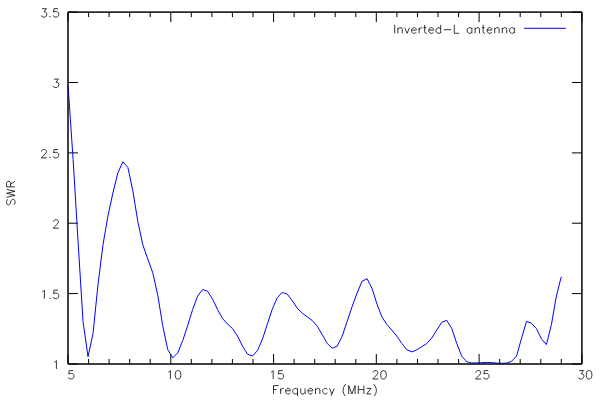 Raydel has provided a GNUradio program to capture the signal. I don't intend to go into detail about what each program does or why as I don't have time but purely to describe how I received the images and offer pointers to Oleg's website where more information is available. The confusing aspect of receiving these images is that there is more than one way of doing it. The strength of the signal from the satellite is not strong and I did not receive a good signal until I added the pre-amp. The RTL dongle has the necessary bandwidth, it may be possible to use an original Funcube Dongle Pro but this only has 92khz of bandwith and this may be too narrow. I am sure a Funcube Dongle Pro+ will work very well. Not only does this have 192khz of bandwidth but the FCD's are both very much more sensitive than the RTL dongles. Other SDR receivers will also work of course. So, first thing to do is optimise your receiving set-up and adjust the gain of your SDR device using a known signal source. I use London Heathrow ATIS as this transmits all the time. You need to find the sweet spot of your dongle between LNA gain and IF gain, to maximise gain without overloading the SDR. This is crucial, I copied an 88 degree overhead pass on Sunday and only received a short amount of picture. The next day the image you see here was at about 66 degrees elevation and I got very good results. I have a feeling that finding the sweet spot of the gain controls might be difficult. Once you have optimised your settings use a program like GPredict or your favourite satellite tracking program to identify suitable Meteor M-N2 passes. Use Raydel's GNUradio soft symbol decoder to capture the data stream from the satellite and decode to a format that Oleg's image processing program can understand. Raydel's instructions (and a link to the GNUradio program are here, note that this document covers several different method of receiving and decoding the signal). The received constellation should look like this is you are receiving the signal correctly. Once the soft symbol.s file has been received then it is time to open Oleg's LRPTOffLineDecoder program to produce the image. This is a Windows program but runs well under Wine in Linux. Click the "72k" button (as the satellite seems to be sending data at a symbol rate of 72k but it has also sent at 80k recently). Click "RGB" to generate a false colour image, you need to select the RGB drop down lists to correspond to the wavelengths that were received otherwise you will just get an all white image. You can also change the RGB settings to change the colouration of the image. At this point you can also save the image. Oleg's website has other examples of images received plus links to the software etc. The picture below is the full image I received on 16/9/14. The white bar occurs every 6.5 minutes and is a programming error of the satellite code that apparently cannot be resolved. This is not a soup to nuts description of how to receive these images. You will need to read the instructions produced by Raydel in particular but it should enable you to capture these images quicker than the several weeks that is has taken me to learn how to do it. I had been sceptical of digital voice modes as the standards supported by the major manufactures are all proprietary. This will lead to competing 'standards' along the lines of Betamax vs VHS where early adopters are the losers. Recently I became aware of an open source standard which will work on existing pc's called FreeDV. I have also realised that digital voice on HF is no different to RTTY, PSK or JT65 for communicating because those modes are also only able to be decoded by computer. Given the woeful state of my CW I may as well add that to the list as well! My computer runs Ubuntu 14.04 with the xfce windows manager. There is a FreeDv package available from the FreeDV link above which works with this configuration. I did try to install it on Linux Mint 16 but had problems. The trickiest part of configuring FreeDV is setting up the sound cards. Two are needed. One can be the standard sound card built into the computer and the other can be the sound card that is built into a USB headset (headphones and microphone). To configure the 4 inputs and outputs I needed to use alsamixer and pavucontrol (both available from the Ubuntu Software Centre). alsamixer setup for the internal sound card used for the audio input from radio to computer (using the computer line in socket) (1) Note that 'Input source' is set to the input you are using to get audio from the radio and 'Capture' is used to set the level for that input source. 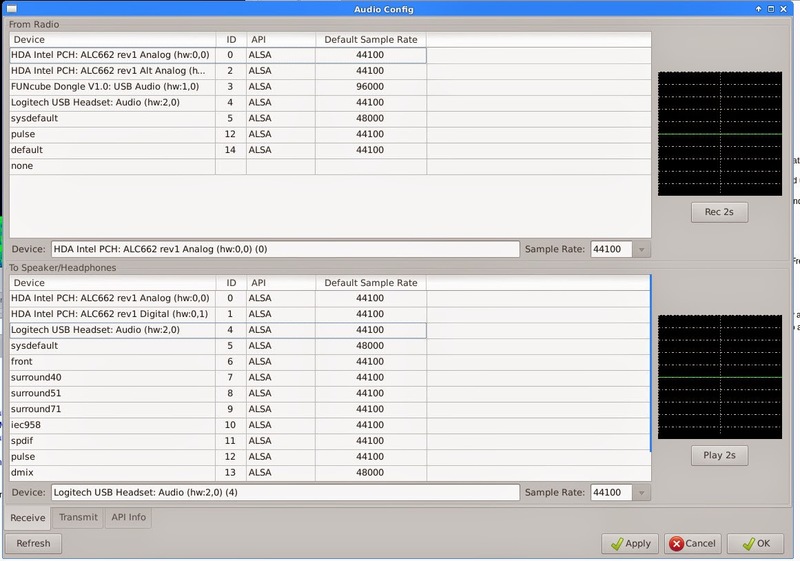 I also had to use pavucontrol (PulseAudio) to adjust the transmitted audio so it isn't over driving the radio, although I haven't experimented enough to see if I could also do this using alsamixer. I think I should be able to. I have a Yaesu FT-920 and the audio in/out from the computer is connected to the data port along with the USB-serial CAT cable for PTT control. 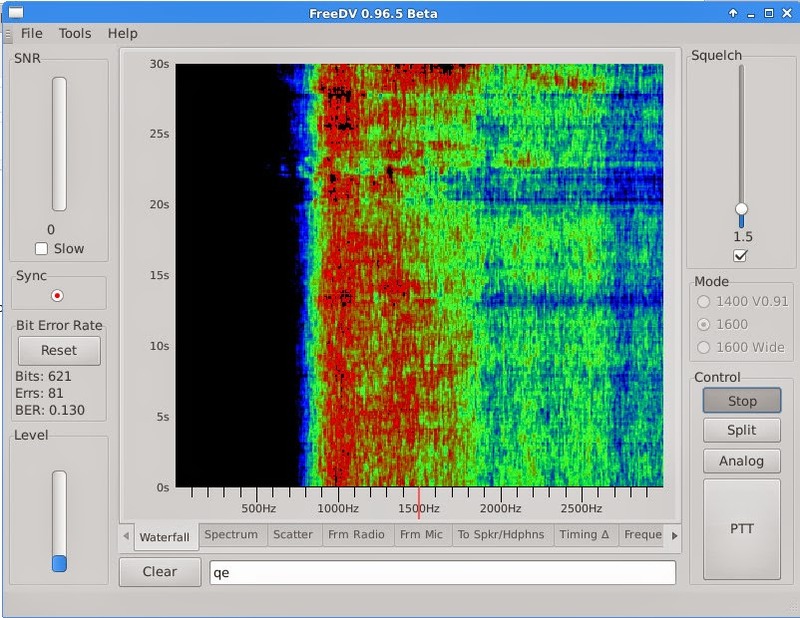 What the FreeDV waterfall looks like without a digital signal being received. That's it for now, there are more instructions for setting up and using FreeDV here. If you would like to set up a sked please let me know, my email is on the top right of this blog or on QRZ.com (G0FCU). The alternative title for this post could be "Even more fun with antennas"! I know that the inverted-L that I erected recently resonates on the bands that I wanted it too (i.e. 10/14/18Mhz) but tuning wire antennas to resonance always involves a lot of running between ends of the antenna and rig, taking notes of SWR achieved at specific frequencies and working out whether to shorten or lengthen the wire. 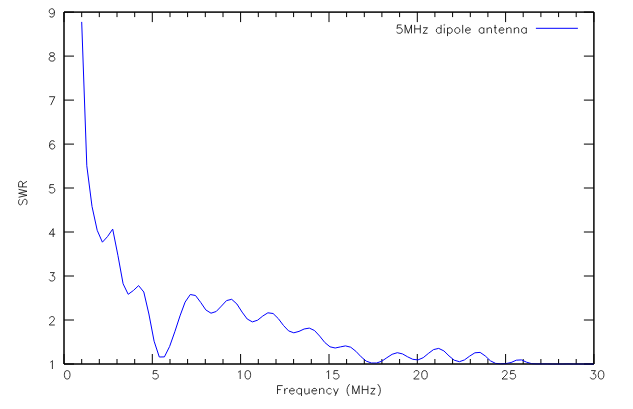 An antenna analyser can help reduce some of this effort as you get a graph of SWR plotted against frequency. However, these cost upwards of £200. Now bring to the table the ubiquitous Arduino, my favourite 'toy' tool of the moment. I found several designs for antenna analysers based on Arduino's but I think it was someone on Twitter who pointed me to the design by K6BEZ. If you have an Arduino and a few resistors this is really cheap to make. I had to buy the diodes and the op-amp, but these cost me less than £10 on e-bay with an op-amp and about 10 diodes to spare. Fortunately I also found Matt Gumbley's website and Matt has designed a Veroboard layout for the K6BEZ circuit. This made building the circuit very simple and it worked first time for me. I didn't have any 50 ohm or 648 ohm resistors so I used a 27R and 22R in series (49R) in place of the 50R resistors and a 470R & 180R in series (650R) in place of the 648R resistors. frequencyA - set the frequency to start the scan from, in Hz. frequencyB - set the frequency to end the scan at, in Hz. e.g. 12000000A sets the start frequency to 12Mhz. For a 1Mhz to 30Mhz scan I use 2000 steps. To get the graphs shown here I have simply copied the data into a spreadsheet, converted the frequency to MHz by dividing by 1000000, and divided the SWR by 1000. I have then used gnuplot to create the graphs. Line 2 sets the output filename to 'g5rv.html'. 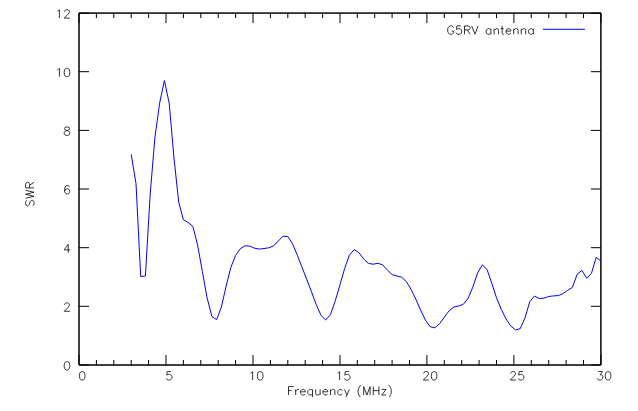 Line 8 loads the data from a file called 'data' (frequency and swr, one pair of data values per line, separated by a space) and give the output the title 'G5RV antenna'. What this shows me is that my G5RV resonates slightly higher in frequency than the 80m & 40m amateur bands but that my 5 MHz dipole and the Inverted-L resonate exactly where I want them to. Even better is that I have got an antenna analyser for less than the price of a pint of beer. Cheers! I managed to get wsprx working in receive mode on my new installation of Linux Mint 16. The realtime waterfall makes it much easier to ensure that your radio is accurately set to receive in the wspr sub-band. I found that my FT920 reads about 40Hz low as a result. However, it crashes when coming out of transmit mode. Consequently, I installed the older version wspr 2.0. This also had a problem with one of the Python libraries but there was a fix documented on the wsprnet.org website. This means that I can now run wspr with a little more power than previously, my broadband HF amplifier only produces about 0.5W. I have been wspr'ing with 5W and the results using my new inverted-L you can see in the screenshot at the top of the page. I am amazed at how far 5W will reach. However, it is a little too easy, on my first transmission my signal was received by KK7UQ on the west coast of the USA. After an hour wspr'ing on the inverted-L I switched to my G5RV and the difference is considerable. Although the G5RV is higher than the inverted-L (around 12m versus 6m high) one leg runs E-W and the other leg NW-SE. The inverted-L runs SE-NW pointing directly at north America. 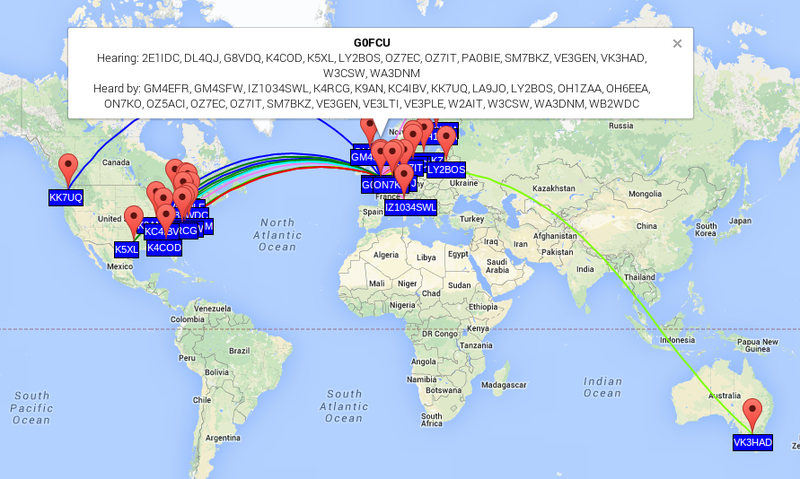 The resulting wspr spots from the G5RV are below. Interestingly I received VK3HAD equally well on both antennas and KK7UQ received me equally well until dusk fell when a few more US stations heard me and were heard by me. Along the greyline I was heard by ZL3DMH at 19016km distance. This isn't a scientific test, by any stretch of the imagination but very interesting none the less. However, what it has shown me is that 5W and wire antennas equals QRO in wspr terms! Good results with my new Inverted-L overnight. 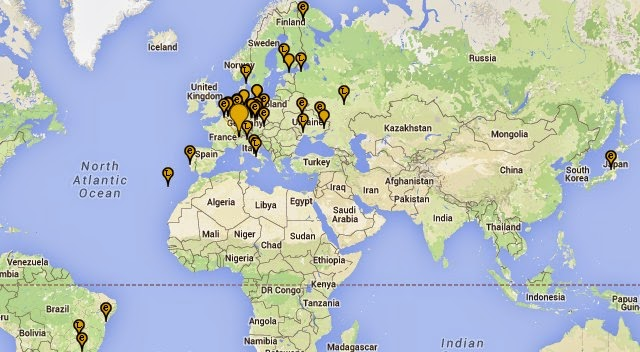 Running 500mW I got multiple decodes from the stations you can see on the map above. The tx is the same homebrew amplifier that I have used previously so the antenna is the only item I have changed. With my other antenna, a G5RV, I had only been received once in the USA. Overall this confirms my initial findings that the Inverted-L pointing at north America is performing very well. Many years ago I participated in many VHF and UHF contests with the G4VAT contest group so I sort of got drawn into this 70Mhz contest today. I have described my new 70Mhz elsewhere on this blog and this was a good opportunity to give it a good try out with my homebuilt Moxon Rectangle antenna. 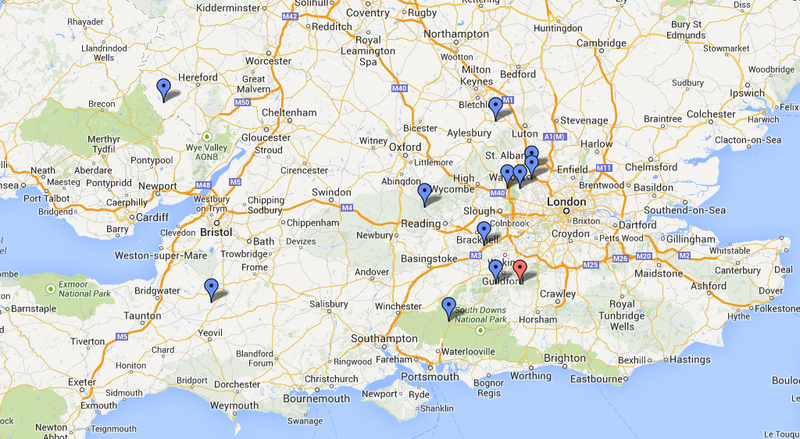 The result was that I worked all the stations that I heard, except one who was a long 230 miles away. He heard me on an aircraft reflection but it didn't last long enough for a full exchange. I was pleased to note that most signal reports I received were reciprocal to those that I gave out. There was deep QSB on most signals and comments made by stations who have submitted logs also note the QSB and generally poor conditions. I have just submitted my log to the RSGB contest committee site and I have claimed the grand total of 825 points! The May weather was very warm at the weekend and so I took the opportunity to put another antenna up. I spent some time trying to decide what to build but eventually decided that anything was better than nothing and just got on with it. I then retrieved from the shed a roll of 32 gauge wire given to me by a work colleague some years ago. 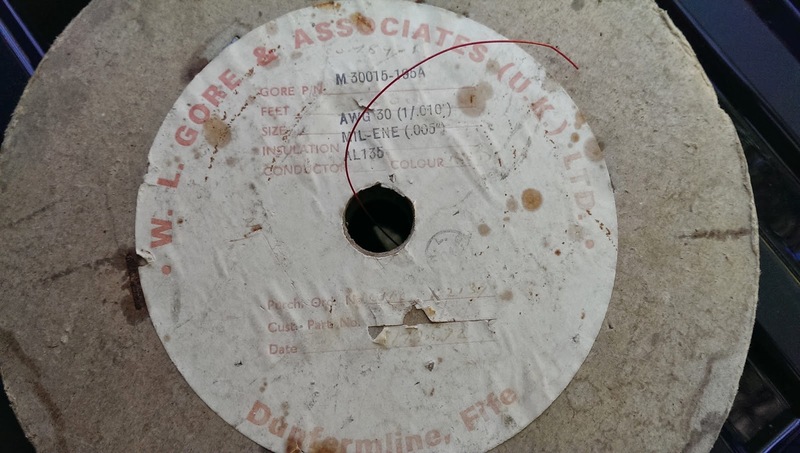 I suspect this wire is quite old as it is manufactured by WL Gore, who are now rather more famous as the manufacturer of the waterproof material GoreTex. This wire is so thin as to render it almost invisible, which makes it difficult to erect but pleasing on the eye in the longer term. I am sure it won't last a winter but it was free so is great for experimentation. The inverted L was hoisted about 7m into a tree in one corner of the garden with the top running down to a smaller tree at the front of our property. Here I had to bend the final few metres (of 37 metres) to make it fit. The antenna was immediately a good match on 15/12/10m, which was annoying as I was trying for 30/20/17m. I fiddled around with it for a while (and actually shortened it so there is now no bend in it, but it still didn't resonate on the desired bands) before leaving it for the night. The next day I relocated the balun closer to the ground and the stream that runs along the back of the garden. Hey presto, a 1.1:1 match on 30/20/17m was achieved. Obviously the antenna elves had been out during the night and tuned it to resonance for me! I can only think that changing the angle of the more vertical part of the antenna had a significant effect. The result is an antenna that is directed towards north America and I can hear Canadian and US stations on it that are several S points down on my more elevated G5RV. So I am classifying this as a great success, and it has caused me to have more QSO's which is even better. Here are a couple of videos showing the difference between the inverted L and the G5RV, the G5RV is antenna A and the inverted L is antenna B. The antenna input selected is shown to the top right of the frequency display. OK, so you cannot make out the A and B on the video, but take it from me that the inv-L is the stronger signal as I switch between the two. OK, here is one, I'll add the other later. At long last I have completed my 70Mhz transverter, which I first wrote about here. Since I took that video I have rebuilt the transmit stages using Manhatten style construction. I have also replaced the tx/rx switching circuit with a much simpler arrangement. Whilst it is probably not the most sensitive receiver around I am proud of the fact that I built it from scratch. It is the design by EI9GQ published in Radcom in June & July 2009. The transmit output is now 100mW. To bring this up to a level to drive my Pye A200 amplifier I bought a ready constructed amplifier from SP2DMB For 100mW input this gives 8W output. Using this to drive the A200 gives well in excess of 50W but I have turned the A200 down to avoid over-driving it so it only outputs 50W. 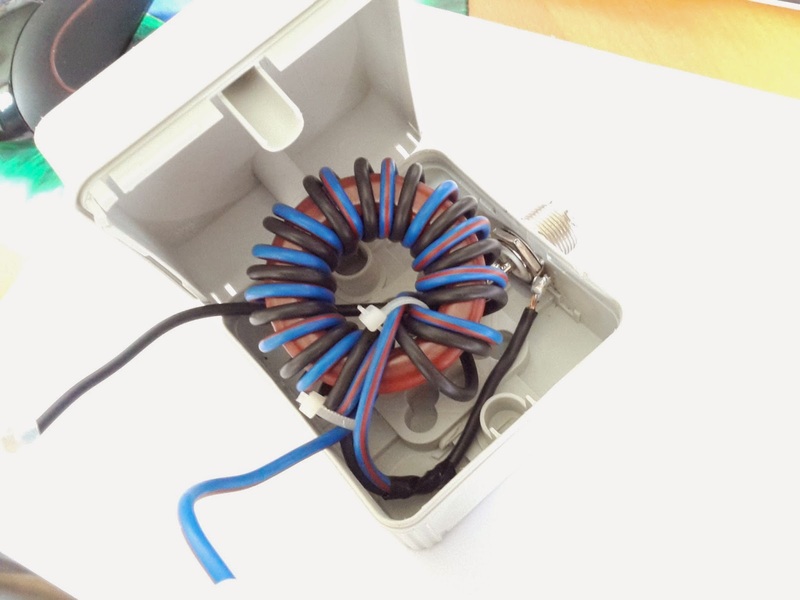 I have learnt so much from this project about receivers, transmitters, construction techniques and fault finding. Unfortunately I have also found, along with my optician, that my close up vision is now very different between each eye. This makes soldering difficult as I find it difficult to judge depth of field, so any sort of SMD construction is definitely not for me. Another visit to the optician is due and I'll try to get a pair of glasses that makes soldering easier. To augment my horizontal dipole I have made a Moxon Rectangle antenna for 4m using this design. Now this is on the mast I have found that I can receive the GB3BUX, GB3RAL and GW3MHW beacons all the time rather than only by aircraft scatter. My QTH is on the left, the first piece of high ground is the North Downs in Surrey, the second is the Chilterns around High Wycombe and the next piece of high ground is the Peak District south of Buxton. I have left the dipole on the mast attached to my FunCube Dongle SDR. I'll use this for spotting Sporadic-E openings. I noticed last year that some of the tones I receive around 70.230 - 70.240 Mhz get much, much stronger when there is Sp-E around, so they are a useful indicator of propagation. Now, roll on the Sporadic-E season! Building on my Arduino & AD9850 powered WSPR transmitter I have extended the code to also transmit QRSS CW and Sequential Multi-tone Hellschreiber. I have had a problem where my GPS was not getting a fix and so I was not able to get the correct time for the WSPR transmissions. Consequently, I have created two versions of the sketch. One uses a GPS for its time source and the other uses the Internet Network Time Protocol (ntp). The ntp version requires an Arduino Ethernet shield and Internet connection. I have learnt a huge amount about Arduino programming while working on this. However, I am going to stop tinkering with the programming now and use it to test out some different antennas. The enhanced GPS sketch can be downloaded from here and the ntp version from here. Items #3 & #4 on my 'Things to do in my 30th Year as a Radio Amateur' were to have a go at QRSS. The article by Ian Liston-Smith, G4JQT, in the February 2014 edition of Practical Wireless was instrumental in spurring me into action on this activity. I had a look round the Internet and found several pieces of software that are specifically designed to receive QRSS signals. They were Argo, QRSS-VD and LOPORA. I run Ubuntu Linux on my pc and setting anything up to run with sound cards always seems to be a little difficult (or maybe it's me). I got Argo working quickly but it is a Windows program running on Linux so I spent some time getting QRSS-VD working. It is written in Python so will also work on Windows. It works well but the key to it was changing the bandpass low and high settings to ensure that the QRSS sub-band was being decoded. I haven't yet got LOPORA to work with my sound card yet. The QRSS-VD website has comprehensive instructions on how to set up and use it, most of which I haven't yet read! 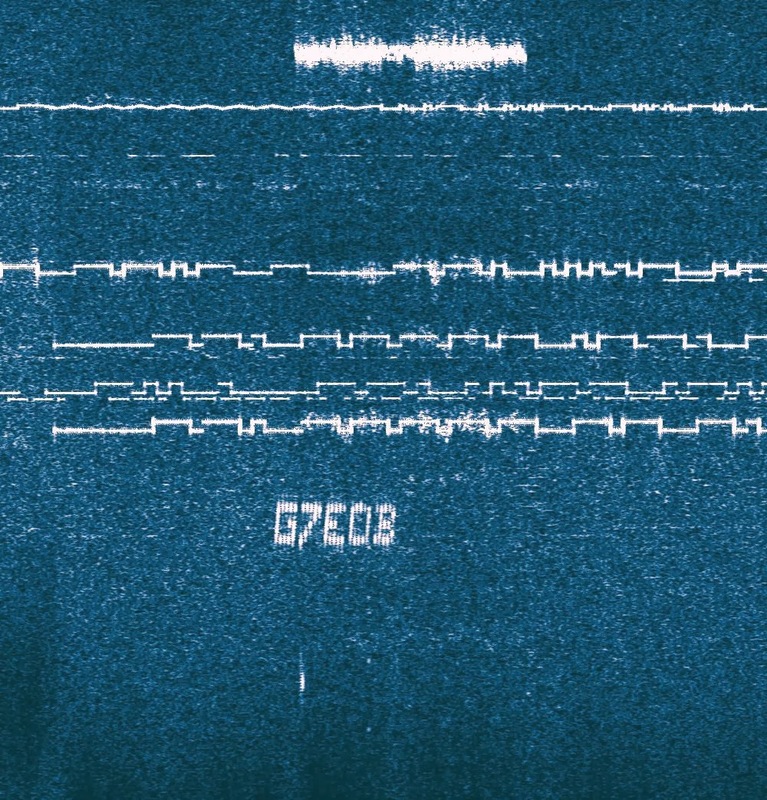 An example of decoding QRSS using QRSS-VD. In summary I feel that QRSS combines the technology of receiving QRPp signals using the power of your computer to decode them (along the lines of WSPR) with the beauty of being able to decode them yourself. 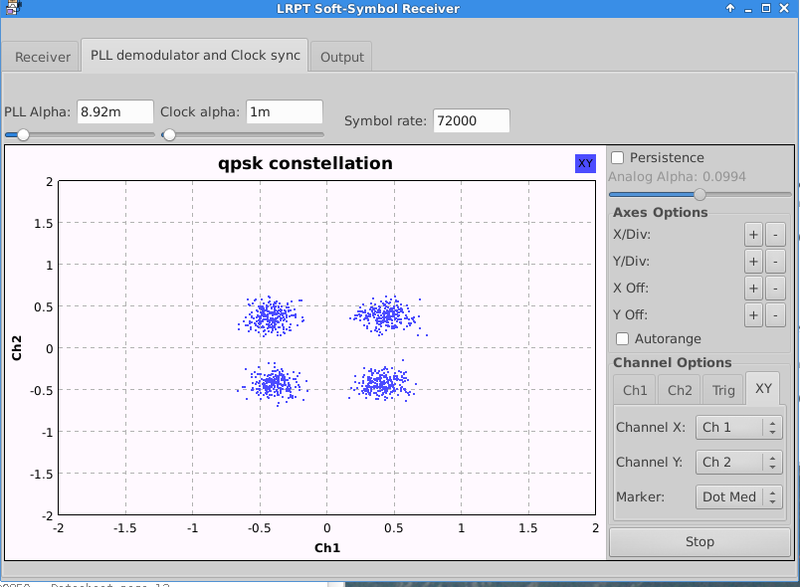 In practice, combining QRSS and WSPR is a great way to analyse propagation and antenna performance. I have amended my Arduino/AD9850 based WSPR transmitter so that it transmits alternatively between WSPR and QRSS. More of this in a future blog post. 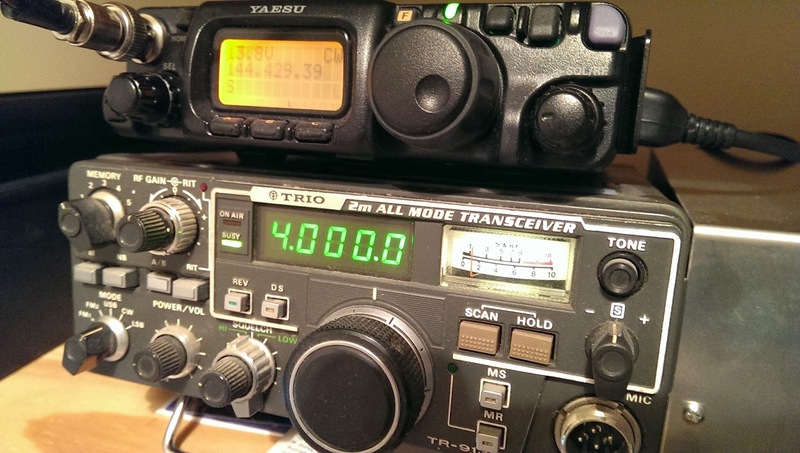 to an HF to UHF rig in 2014. My first contact was on 7th September 1984 with G1/PD0HWL/M on 2m. He was only a few miles from me but I hadn't managed to work out the use of the RF Gain control on my newly purchased Trio TR-9130 and I had it turned all the way down. Velerh probably wondered why I gave him a 33 report when he gave me a 59! By the time I had my second QSO two days later with G1EXO I had worked it out and 59 reports were exchanged both ways. My early ham radio exploits were predominantly with a group of amateurs I met after I left college and moved to Stevenage in Hertfordshire, these included G0HOP, G6LMV, G1IFL, and G1LIQ among others. That group of Stevenage amateurs ran the G4VAT contest group. I participated in many VHF/UHF contests with them, which were great fun. On one occasion the brakes on my old Mk 1 Vauxhall Cavalier failed on the way up the hill we used top operate from at Pegsdon. This site conveniently had a pub called the 'Live and Let Live' located at the bottom of the hill. I have found in my log book details of a contact through the OSCAR-13 satellite with JA1CG on 14/8/88. In that same session I had first contacted two German stations. I am pleased to see that Haruo is still active. This was a 145/433 Mhz contact and I remember that G0HOP was instrumental in working out that the satellite would be on the horizon so we would be able to make contacts with our horizontally polarized beams (with no elevation control). I have been somewhat less active since marriage and children (1999 and 2002/2004 respectively) but I did use the proceeds of a very generous bonus to purchase a Yaesu FT-920 HF rig. Have a JT65B QSO - I have completed this and was very non-plussed by it. I don't think this is a mode for me. I've had a few more JT65 contacts now and will probably have more. 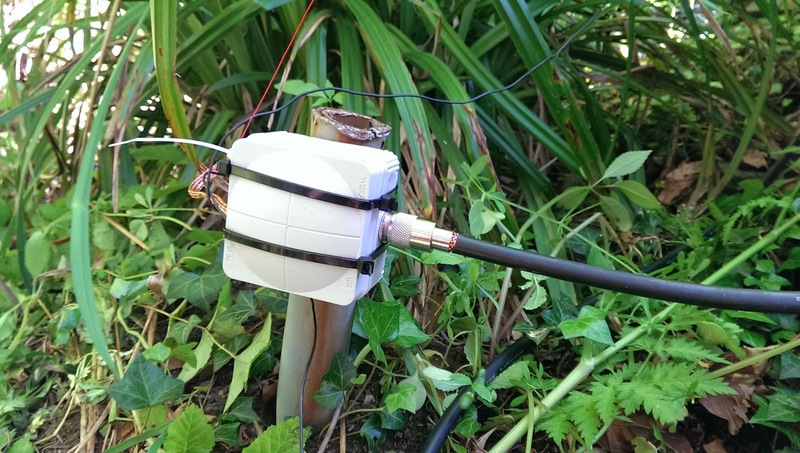 Run WSPR to test antenna configurations - I built an Arduino WSPR system last year and see WSPR as ideal for learning about propagation and antennas. Erect a 50/70Mhz beam - InnovAntenna have an interesting looking dual-band beam. Have a go at meteor scatter operation on 50/70Mhz. Receive signals bounced off the moon. I have on old 19 element 70cm beam that I might press into service to attempt this once. Do some portable HF operating with my FT-817. Get my CW speed back up to something usable - I think this is a long shot but it needs to be on the list! That's enough to be getting on with. Other blog posts will follow with updates as I tick these items off.